The role of Collections Assistant for Plymouth Museums Galleries and Archives was created in 2017. At present the team consists of Jackie, Claire and myself (Val). Our role is a busy one which we absolutely love involving numerous projects for the new galleries for The Box. Recently we have also been decanting the Merchant’s House. The Collections Team worked on the major decant of the Museum and Art Gallery building last year. 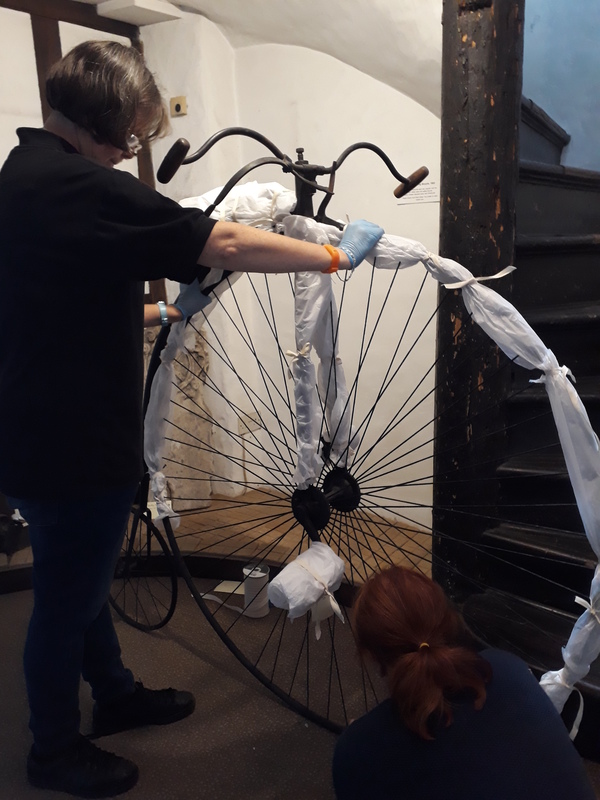 When we were asked to assist with the Merchant’s House decant, a Grade II listed Museum satellite site we were excited to be involved, especially as we have previously worked at the House as part of the Museum Assistants (front of house) team. The Merchant’s House which was probably built in the early 16th century has seven rooms, three landings and one attic floor where Museum objects were displayed. 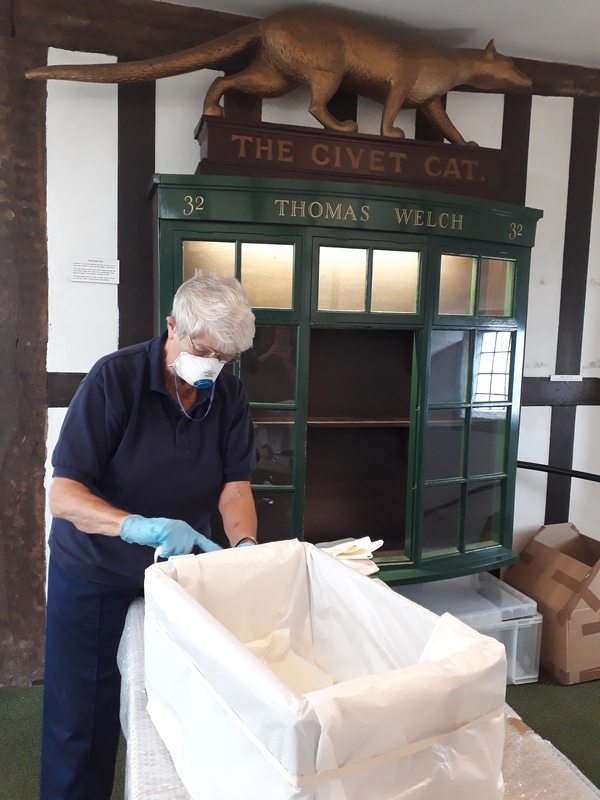 In August this year the Collections Team started the major task of removing all these objects prior to a conservation project which is set to take place on the site. The House has been closed for a while as it is in need of some essential restoration. An options appraisal for its future use is in the pipeline. Once a preferred option has been chosen the renovation works are likely to start quite quickly. We have huge commitments coming our way next year with the preparations for moving everything into The Box, so having the time to decant the Merchant’s House now has worked out well. The objects in the House come from right across the museum’s collections. These include social history, ceramics, silver, maritime and civic, natural history, archaeology, art prints, posters photographs, and furniture. This was clearly going to be going to be a large project so we decided to enlist the help of a group of volunteers. These volunteers Vicky, June, Michael and Joe, our British Museum apprentice, were really enthusiastic and worked very hard to assist us. Every object had to be identified, numbered, condition checked and entered onto a paper inventory. Some objects required remedial cleaning before being wrapped in acid free tissue, sometimes tied with unbleached cotton tape, and then placed in acid free conservation grade boxes. The boxes then had to be double layer poly wrapped. These boxes were then created as packages on the museum database and given a current location which would be updated when they are moved to our offsite store. 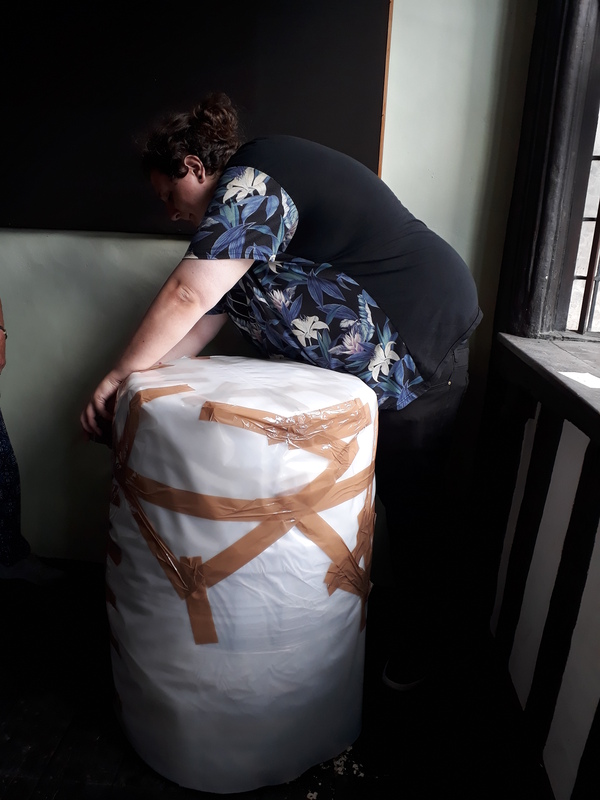 The boxes and smaller soft wrapped items were transported in the Museum vans by our Team Leader Ian with help from a Museum Assistant, Collections Assistant and Joe, our British Museum Apprentice. 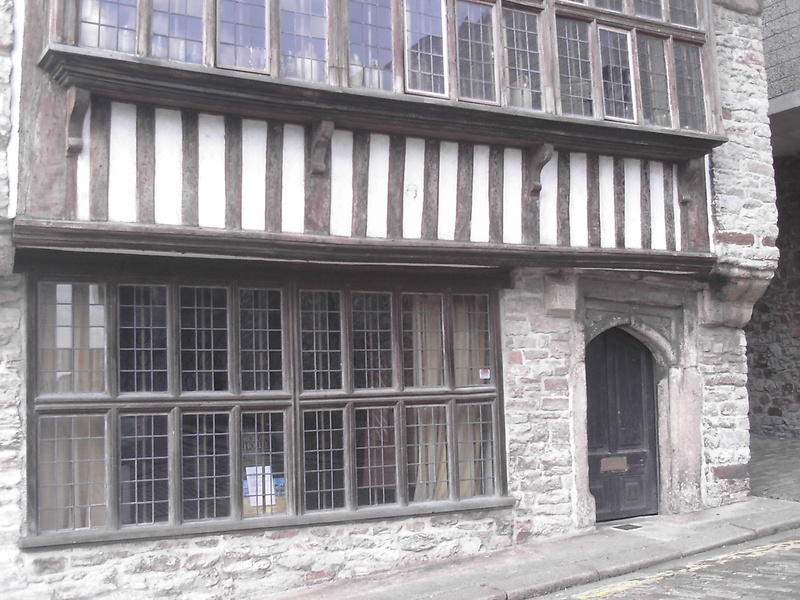 Being a timber framed building there is always the likelihood of pest infestation at a site like the Merchant’s House. While we were decanting we had to be very vigilant, inspecting items carefully for evidence of woodworm and Death Watch Beetle. Woodworm is the most prevalent so we were on the lookout for the tell-tale holes and examples of frass (the fine powdery refuse left behind) after they have bored their way out of the wood. Our Decant Officer Steve and Conservation Officer Tonya gave us advice and information on what to look for and these items were double poly wrapped for the freezer with a freezing time of two weeks. The Museum has an ongoing freezer programme to deal with pests. Another issue was dirt and mould so most objects were given a remedial conservation clean with a smoke sponge. This is a unique dry sponge made of vulcanised natural rubber used mainly for cleaning soot and fire damaged items. Larger items proved quite a challenge to wrap so we sought the help of Shirley a long time museum volunteer who wrapped most of the animals in the Natural History gallery during the Museum decant. 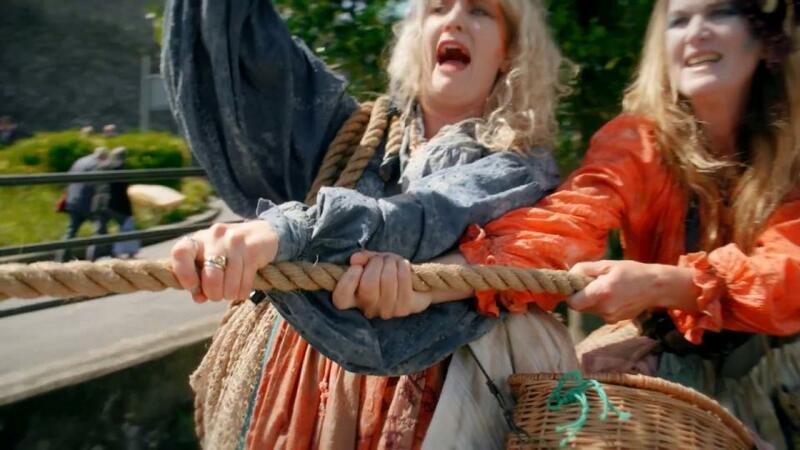 Larger items that proved fun were the Penny Farthing (see the picture above! 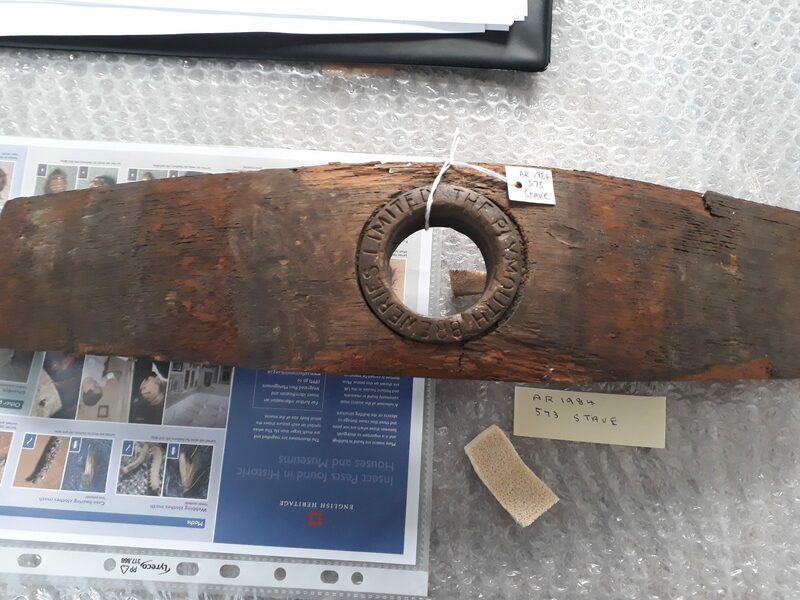 ), a Bavarian bear hat and umbrella stand, a Doll’s House and a very large fragile barrel which, along with large items such as the Ducking Stool, were going to be transported by a specialist heavy removal company. The whole project was a good example of planning, organisation, hard work and co-operation. It was also a great opportunity to learn from and test the process that will help with the future decants of the collections at the South West Film and Television Archive and South West Image Bank, two of the principal partners for The Box. I’ve come across a few images this month that show the construction site from different vantage points to the ones I take photos from so I thought I’d start this post by sharing them. The first couple were taken by a colleague during a hard hat tour in mid-September. The third image was taken by our film production company when they were setting up a camera on site at the end of September. The images help give a better understanding of the size of the space where our extension will be built. In the third image you can also really see the progress that has been made with the reduced level dig. The most visible change on site since our last #BuildUpdate has been the addition of a tower crane. 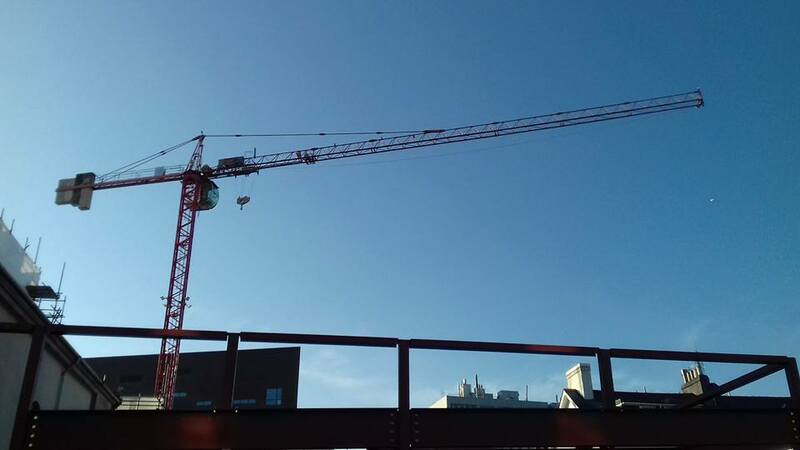 Tower cranes are a common fixture at most major construction sites. Rising high into the air and reaching out just as far, they’re pretty hard to miss! There’s a great deal of regeneration taking place in Plymouth at the moment so there are a few of these currently dotted around the city’s skyline. Here are a couple of images of ours. The first was taken from the bottom end of Tavistock Place. The second was taken from Chapel Lane. 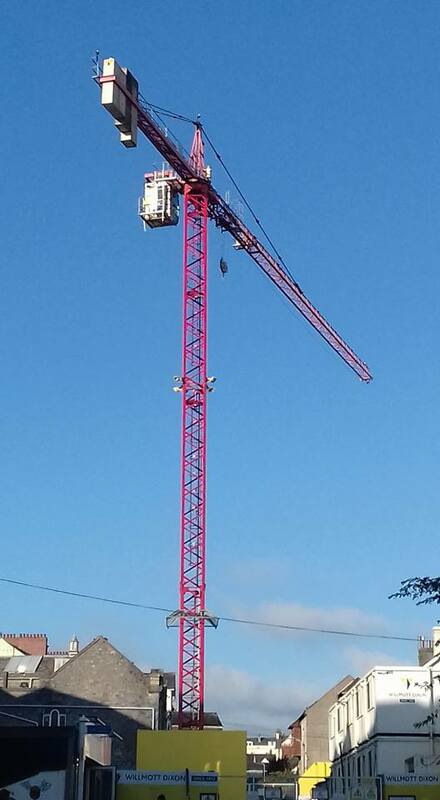 Our tower crane measures 40 metres high and took a few days to assemble when it was delivered to site. If you’re standing in the North Hill/Drake Circus area it’s clearly visible above all the rooftops. The construction crew will use it to lift a range of heavy building materials that are needed for our extension. You can find out more in this video clip. Thanks to Willmott Dixon for their help with making this short video. We’ll be back next month with another building and construction round up. Soundview is a Plymouth-based video production company. We love our city and have been excited to watch its regeneration and growth in recent years. 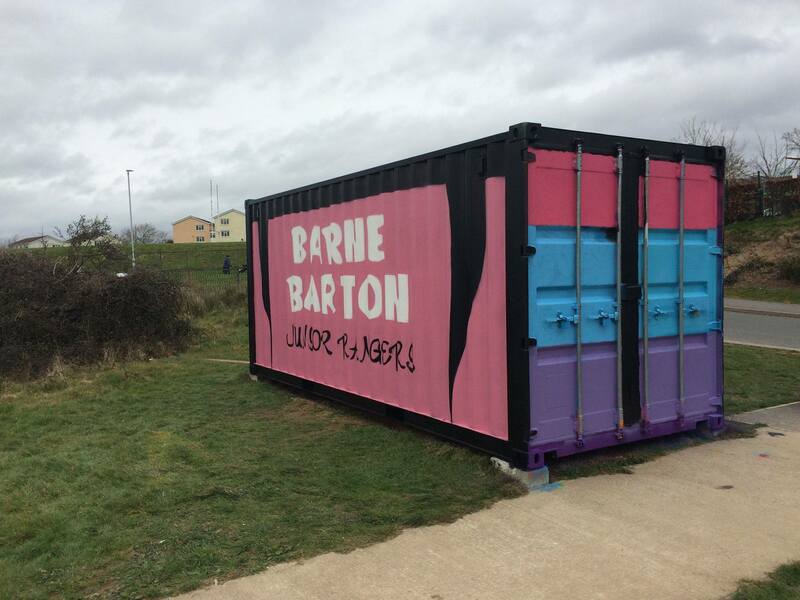 So we were really pleased, when in 2015, we were asked to create a video legacy for one of the symbols of that regeneration: The Box. 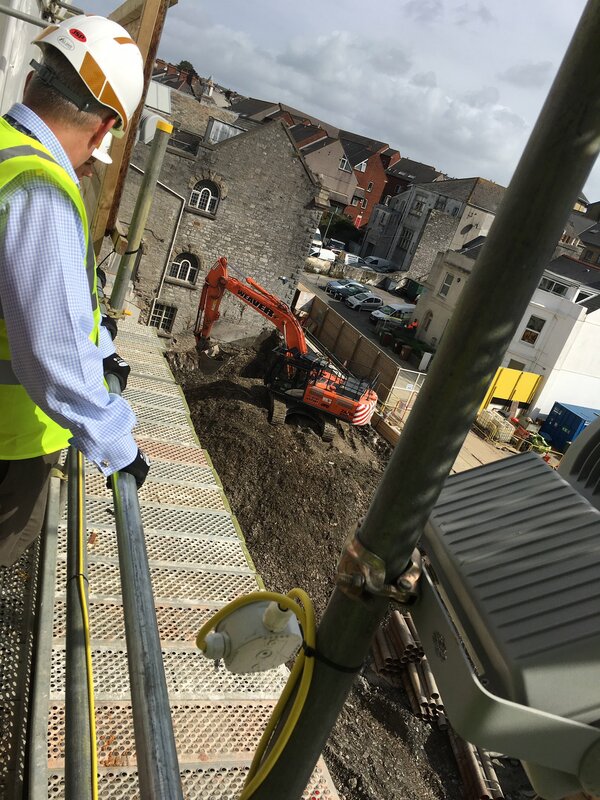 Our task was to help record the transformation of Plymouth’s Museum and Art Gallery, former Central Library and St Luke’s Church into a multi-million pound cultural and heritage centre. 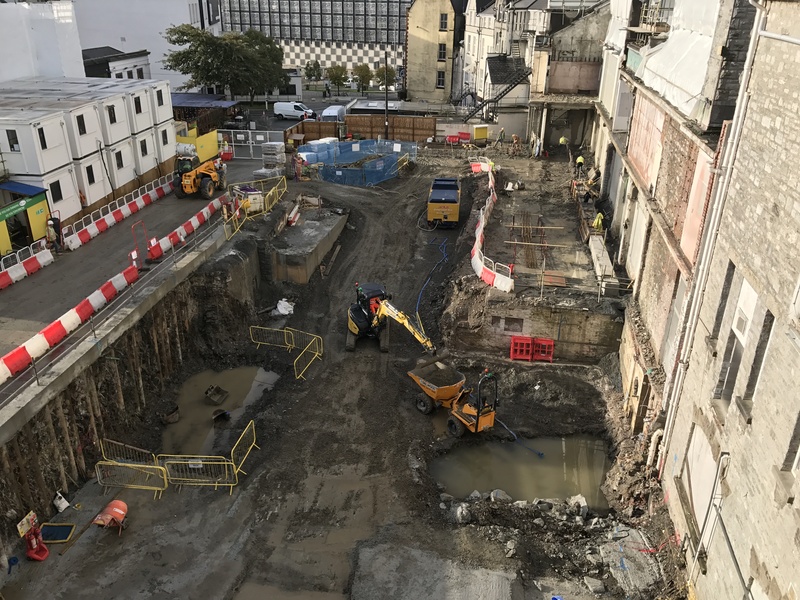 The result would be a series of videos capturing the project’s vision: building a museum for the 21st century, where Plymouth’s rich history could be celebrated under one roof alongside a really ambitious visual arts offer. The videos would help inform current and future generations. 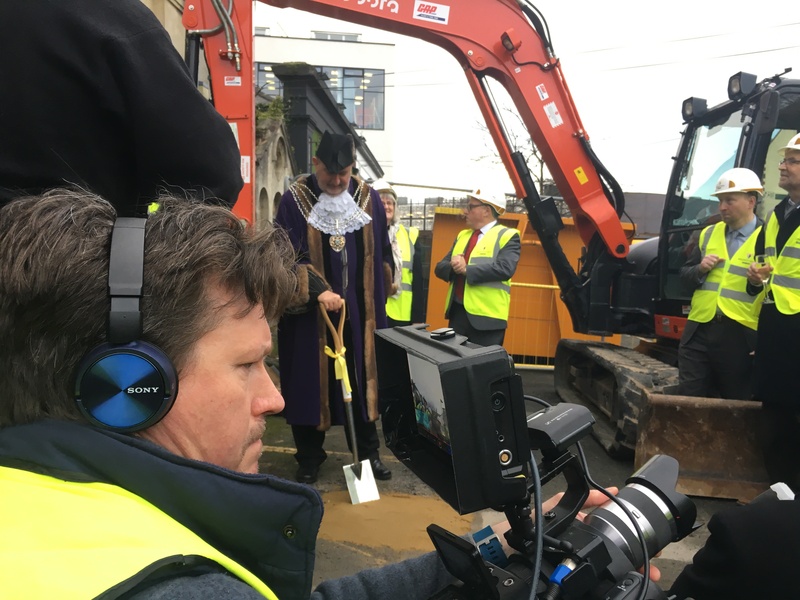 Where pen and quill once recorded the events of Plymouth’s past, contemporary video technology would record the changes happening in the heart of the city. Being involved with such an important project has been rewarding and occasionally surprising. 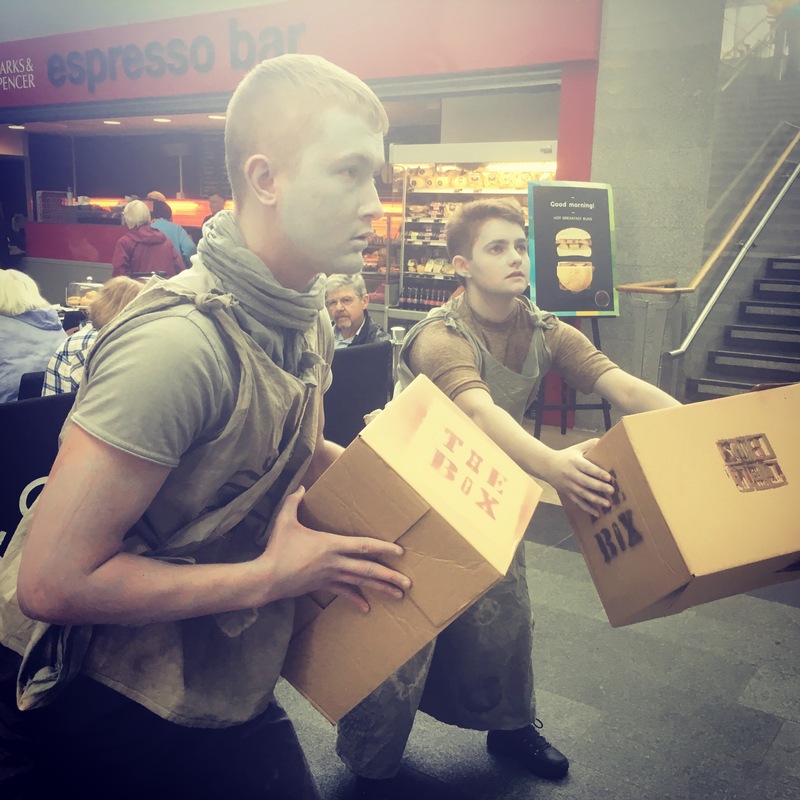 So far we’ve filmed aerial acrobats, dancers and poets, part of the sensational contemporary performance to launch The Box brand in Drake Circus and more. Of course, as film makers, another highlight was our shoot at the South West Film and Television Archive (SWFTA). The SWFTA team gave us access to their wealth of film and video, a moving reminder of Plymouth’s past. This resource will be moved to the Media Lab, one of main galleries inside The Box. It’s a privilege to think that one day our videos might also become part of that archive. Our most surprising encounters have involved the Museum’s collections. We came face to face with a Lamprey (admittedly a `pickled’ or preserved one) when filming the spirit collection. 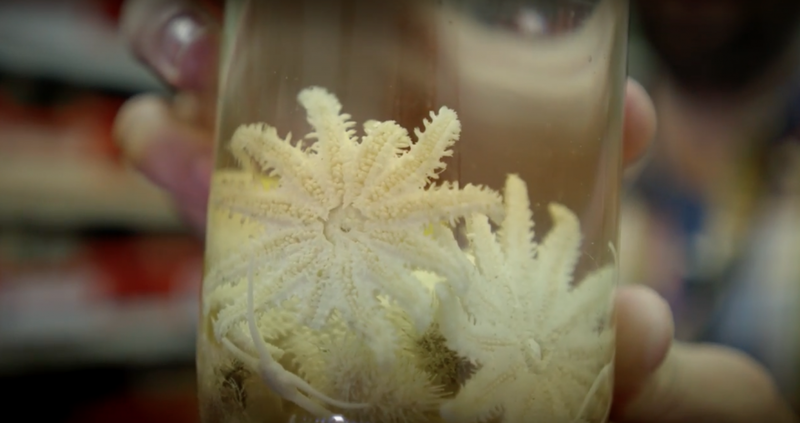 Over 4,000 jars of creatures, some of them the stuff of nightmares, and many of them over 150 years old, were moved to a temporary site. We also never imagined we would be present at the wrapping of an ancient Egyptian mummy coffin from Thebes. Now carefully packaged and in storage, this coffin will take pride of place, alongside other iconic objects, when The Box opens in 2020. Other highlights to date have included filming different aspects of the Museum On Tour programme, particularly this summer’s Ropewalks performances, where we met some interesting characters who were able to tell us what life was like on the Barbican hundreds of years ago. Filming last year’s Illuminate parade at night was breath-taking. 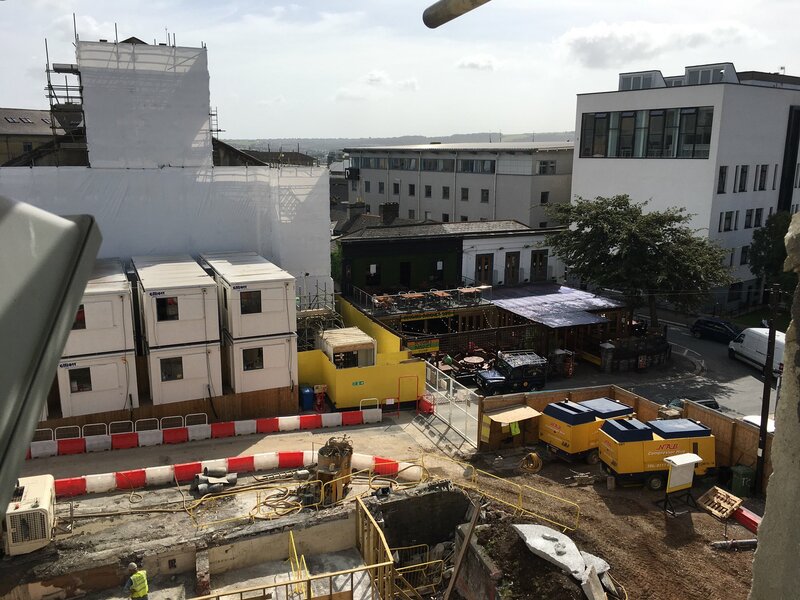 In addition to key events, we have captured pivotal stages relating to the building and construction work. From the initial ground-breaking ceremony, to the demolition of modern extensions and outbuildings. We will continue to film each important moment as this flagship project continues on its journey towards its completion in time for the 2020 Mayflower commemorations. See the Soundview blog for our favourite moments as well as some of our other projects. To take a look at all the videos we’ve produced so far for The Box visit the YouTube channel. We have a busy month coming up as a number of the projects we’ve been working on this year really get into their stride. The ‘Poppies: WAVE’ installation on the Hoe has had amazing feedback since it went on display in the summer. 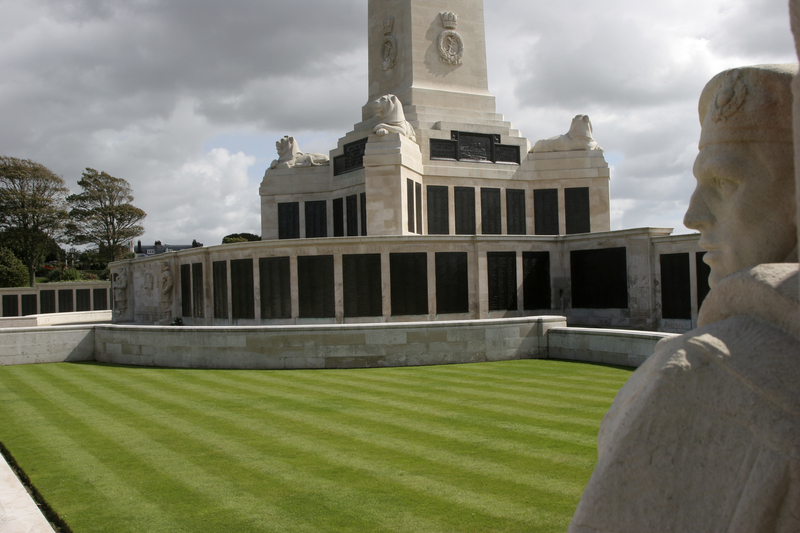 Our ‘Plymouth Remembers’ programme inspired by it includes a range of events this month from family activities to guided walks to photography tutorials – all of which are free. We’re hoping to announce one more special event as part of this programme soon which we’re very excited about – watch this space! 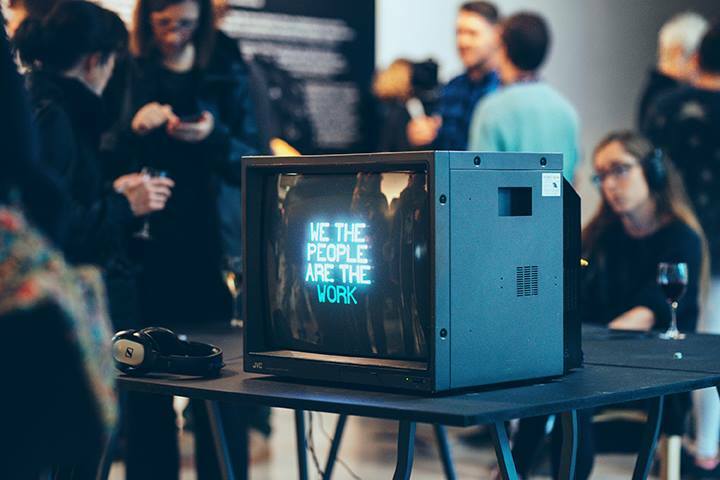 The ‘We The People Are The Work’ exhibition opened at the end of September to coincide with the Plymouth Art Weekender and remains on display throughout October. 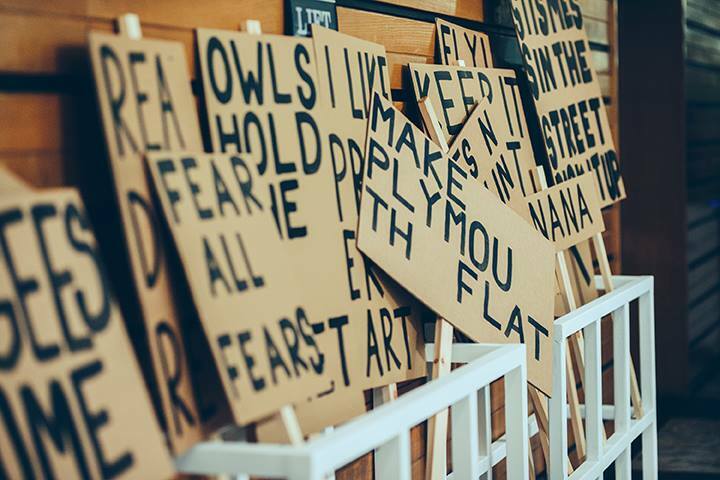 Our commission at the Council House by artist Peter Liversidge takes the form of a sign painting ‘factory’ where people get placards made. You can find out a little more about it in our video clip. It’s been great to see the photographs everyone’s been posting online of themselves with their signs and the different slogans they’ve chosen. We’ll be sharing collages of them on our social media channels throughout the exhibition. Elsewhere, our family events will be keeping some of our staff really busy. 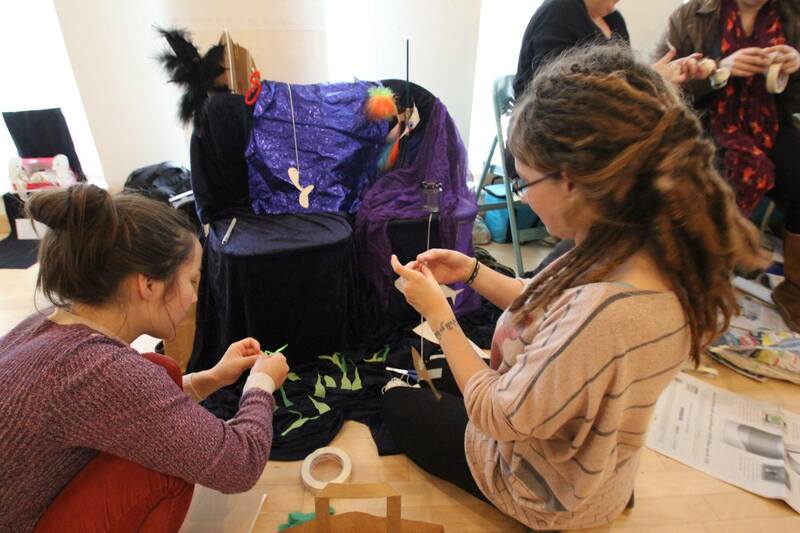 Half term and the annual Big Draw celebration means we have a series of workshops planned, including making banners, creating moving images and devising flick book animations. Many of our sessions are artist-led which means attendees get the chance to tap into a range of specialist skills while they’re having some holiday fun. 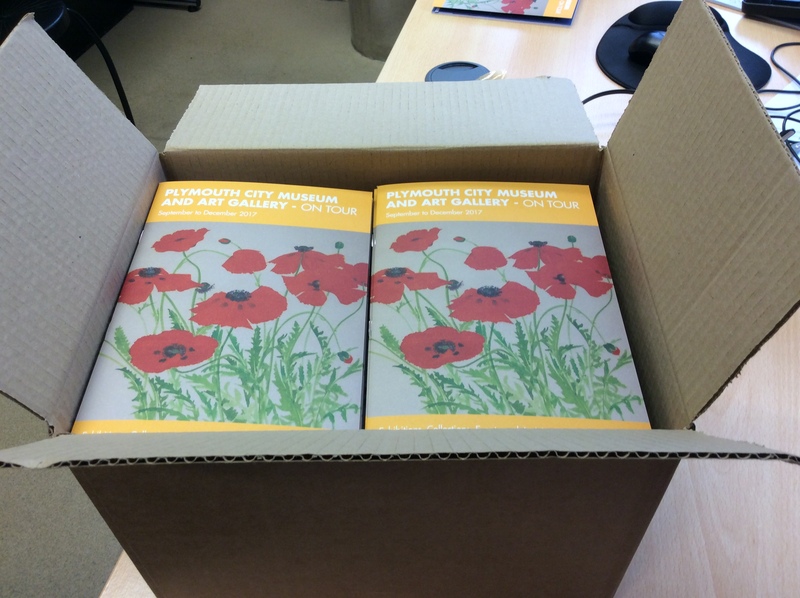 Our new brochure is out and contains all our Museum On Tour information until the end of the year. Thousands of copies are currently being distributed around the city so pick one up from your local library, the Tourist Information Centre, the Council House and a range of other venues. Now our programme until the end of 2017 is confirmed we’re turning our attention to 2018 when there are a number of important anniversaries connected to Plymouth taking place. We’re one of the partners for the Atlantic Project, a contemporary art festival currently being developed for next autumn. We’ve also just made an announcement about the 2018 Plymouth History Festival. The dates for the festival have been confirmed as 5 May to 3 June and people are being asked to send their event information through by 15 December. We’ll have more Museum On Tour updates in November. In the meantime, we’ll look forward to hopefully seeing you at one or more of our offsite events over the next few weeks. 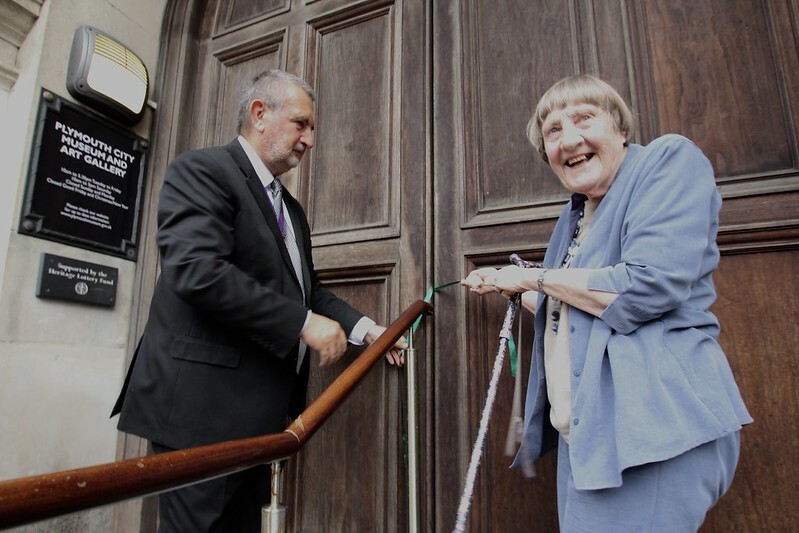 It was in September four years ago when Vital Sparks was launched to help communities run their own creative projects. The scheme is a partnership between Plymouth Culture and Plymouth City Council and is funded by Arts Council England. The idea was to use art to grow confidence and vigour in neighbourhoods that were tired of being told what they wanted. Bringing folk together to get murals painted, community gardens planted and yarn bombs knitted. Creating opportunities for people to get together and be creative. The project has always had a bursary scheme at its centre and the average grant is about £2,600. The funding is complemented by the offering of support to new fledgling projects as and when they need it, so some of my time is spent visiting projects, or calling them to see how they’re getting on. Sometimes projects don’t need any help. At other times I have been kept busy writing funding bids, press releases, risk assessments……the list goes on. I’ve also found signposting new community groups to other more established Vital Sparks funded projects to be significant as they can share their learning. This has enabled us to create a network which I think is a great idea. You’d think that giving money away would be easy but it’s surprising how much work is attached to handing out grants. I’m lucky because being based in the same building as the Plymouth Museums Galleries Archives staff means I have the benefit of working with a Business Support Team who make sure all our grants get paid. Things can get a bit complicated when groups don’t have a bank account! There are instances in the past when I’ve driven my Vital Sparks bursary recipients to the local Credit Union to set one up or had to find other ways to ensure they receive their funding. Every day is different with Vital Sparks. At the moment, for example, I’m lending support to a variety of projects including a growing piece of work called Lesbian Voices. Through ‘Pride In Plymouth’ Jo Lewis has recently secured a grant of £46,200 from the Heritage Lottery Fund. I first came across Jo when she was a writer on a previous project of ours called ‘In Other Words’. She is seeking out and recording lesbian voices and histories of Plymouth and will be starting to recruit volunteers in November. Vital Sparks has provided some match funding for this exciting project and I can’t wait to see what is created. 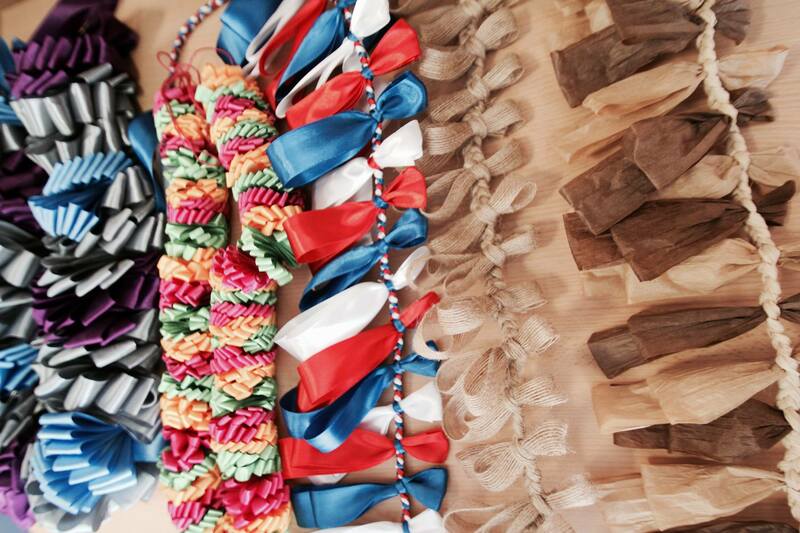 The Plymouth Art Weekender has just taken place and some of our projects ran events during it. On one of the days I popped in on Art, Craft and Laughter to see how they were getting on. 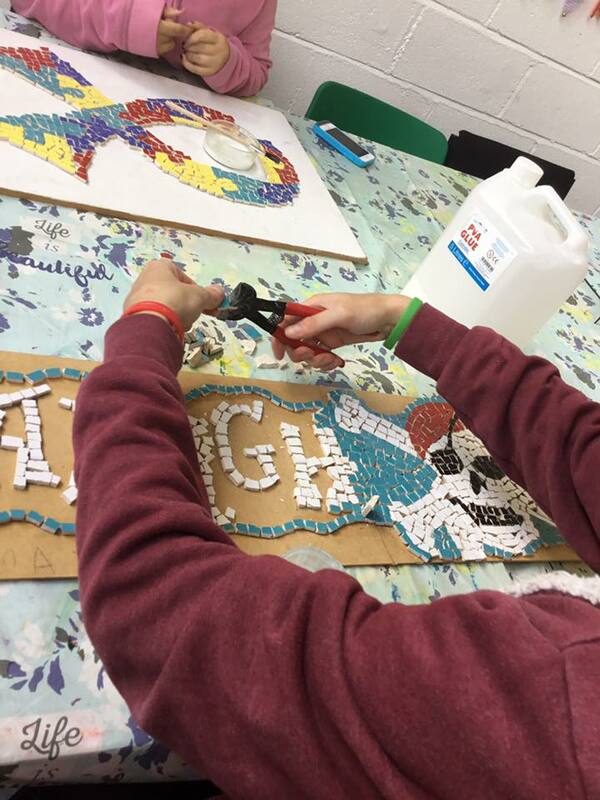 Set up by Debbie and Charlie Seldon they use art and craft to help tackle mental health issues…..hence the laughter. They provide a safe, non-judgmental space for people to experiment and learn. They were taking part in the Art Weekender for the first time. Their feedback will be very useful when we think about encouraging more people to take part next year. I also went to the School of Creative Arts where a free Fijian workshop funded by Vital Sparks was taking place as part of a bigger cultural festival called ‘Bula’ which culminates with Fiji Day in October. It was the first time this community have run a workshop for the wider public and it was great to see so many people there. Whilst our current projects keep me more than busy, I am also focusing on a new and exciting phase of work for 2018. The biggest news in the world of Vital Sparks is the new Mayflower Community Fund that we will be managing next year. We are finalising the details at the moment and the scheme is set to launch in January. If you’re interested in doing something in your community to mark Mayflower 400 watch this space! Has a month really gone by already? How about 12 of them? Since our last #BuildUpdate we’ve reached a whole year since the Museum and Art Gallery closed so building and construction could start. Time certainly flies when you have a huge redevelopment project to deliver! Just in case you didn’t see our social media posts on 3 September, here’s a throwback to the images from our fun-filled ‘Wrap Party’. Click on the picture below to see the full album………. ……….and here’s the video that marked the occasion too. In some ways it feels like we’ve been closed for longer, in other ways it feels like it was only yesterday. On site, progress continues to be made with the piling works that I mentioned in our August post. We’re expecting the delivery of a crane soon as well. This will take a few days to put up but once it’s ready things should shift up yet another gear. I’ll have more information about this next month. 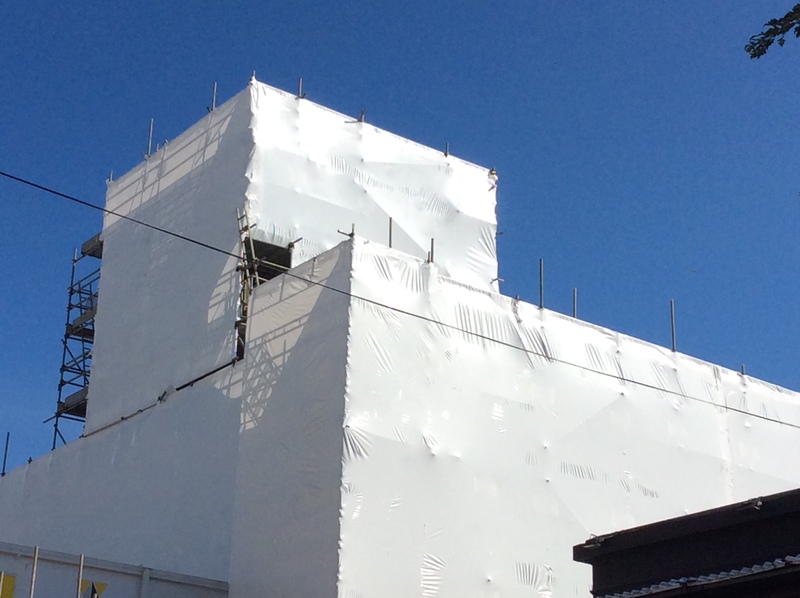 Ourselves and our building contractors Willmott Dixon are also in the process of getting two large banners produced to go on the front of the scaffolding on North Hill. I’ll have more on this next month too. 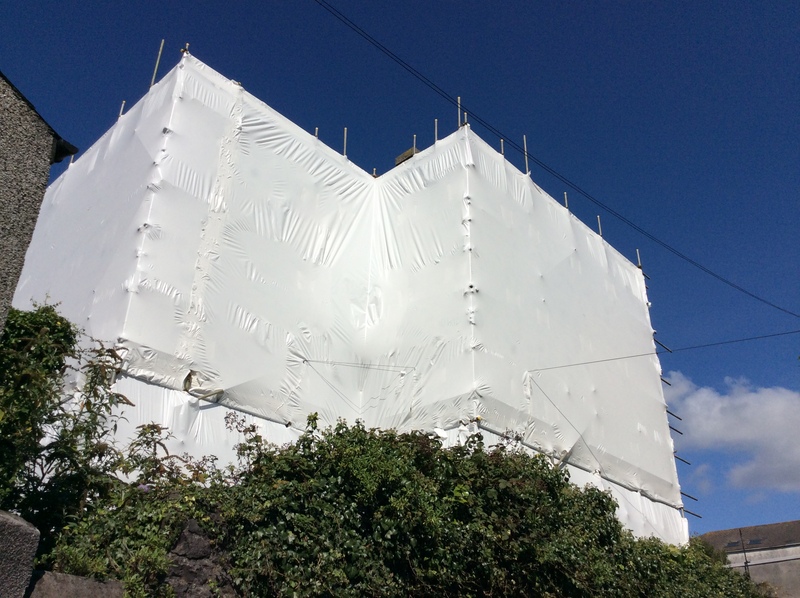 Scaffolding has continued to go up around St Luke’s Church and the protective shrink wrap has also been installed. 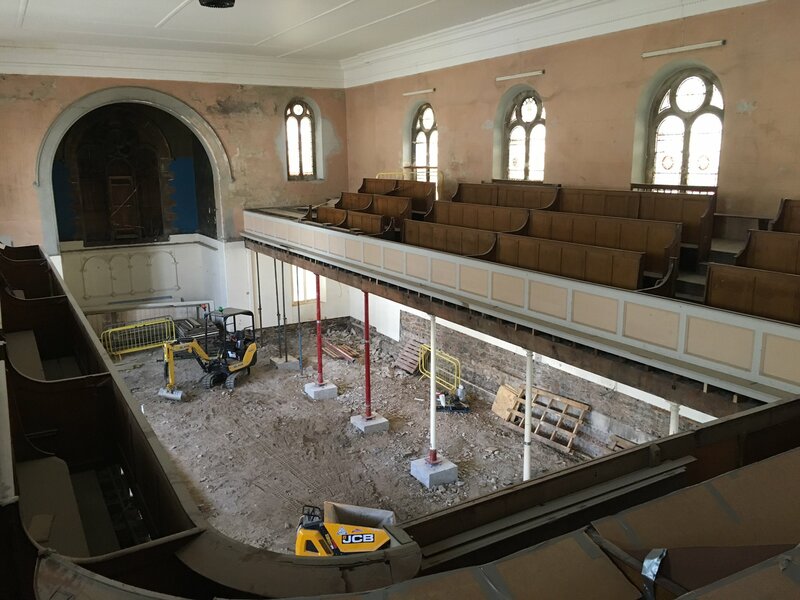 Works are also ongoing inside St Luke’s to protect the pews that are staying and to level out the ground. 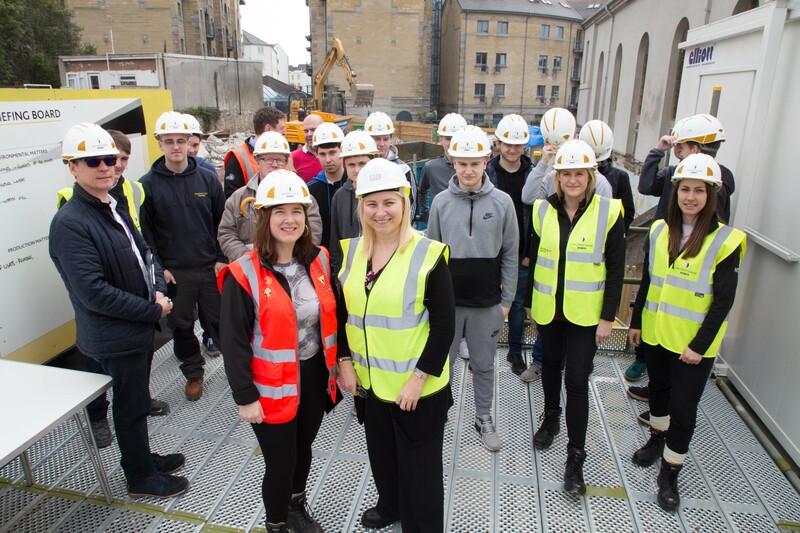 Our programme of Hard Hat Tours continues with great feedback and attendance. There are only a few places left on the 2pm tour next Friday (29 September). Spaces on the tours on 27 October and 24 November are also up for grabs – don’t leave it too late to book! I started this post with an anniversary and I’m going to finish with one too. 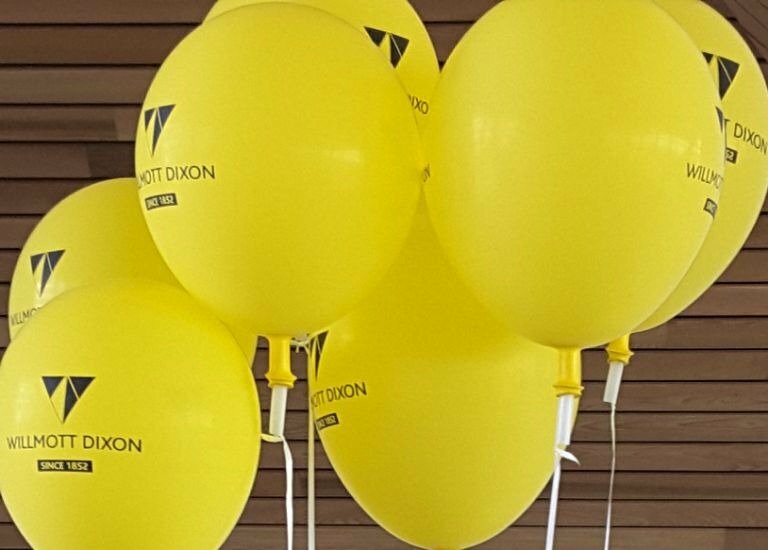 It’s a slightly belated mention, but Willmott Dixon recently celebrated their Devon Office’s first anniversary – congratulations to them. Thanks for reading. There’ll be more updates from the site next month. Robert Borlase Smart was born in Kingsbridge, Devon in 1881. During his early life he attended Plymouth School of Art and Plymouth College of Art. From 1900-01 he attended the Royal College of Art, training as a teacher. From 1903-1913 he lived in Plymouth and worked as an art critic for the Western Morning News. In 1913 he moved to St Ives to study seascape painting under the Anglo-Swedish painter Julius Olsson, only for the First World War to temporarily interrupt his plans. 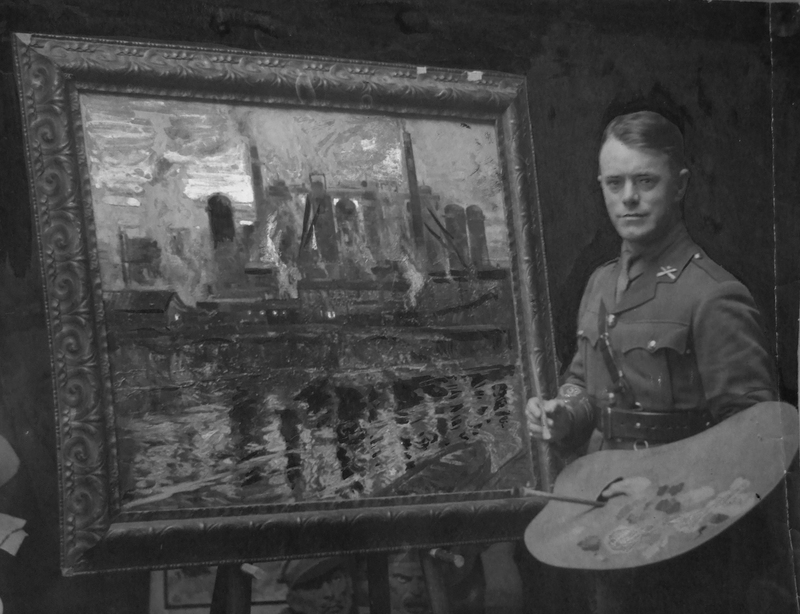 At the outbreak of the War, Smart joined the Artist’s Rifles as a volunteer. 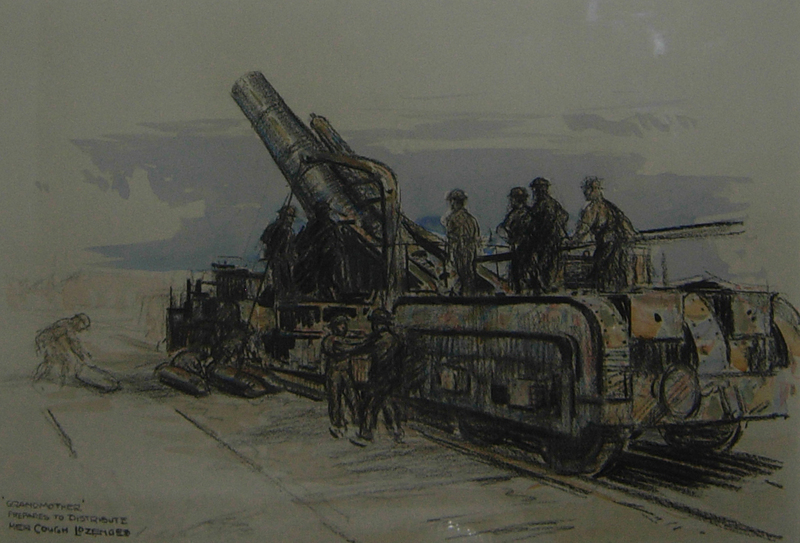 In 1915 he was employed to make technical drawings for the Machine Gun Training Centre. Then, in July 1916, he saw active service and was stationed on the Somme. It was a brief posting as he was recalled to Britain in the September to join the Machine Gun Corps. 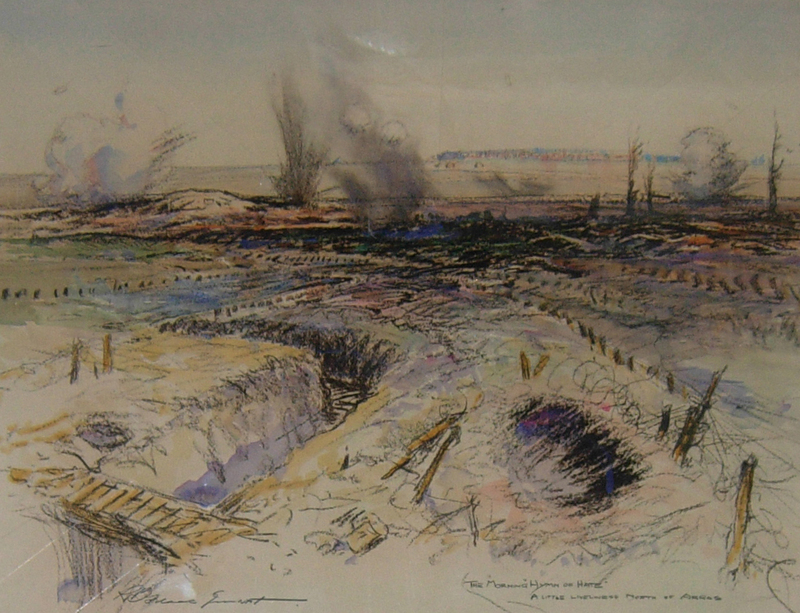 Despite this, the experience had a profound effect on him and he produced almost 40 war drawings – many of which featured scenes from his time in France. Some were purchased by the Imperial War Museum while others are in the collections here in Plymouth. Smart’s short time at the front meant he had to work mostly from memory, sometimes aided by photographs. This did not diminish the quality of his work however. Like the examples shown in this post, his drawings are subtle yet powerful and clearly show the impact of the conflict. In August 1917, Smart applied to become an Officer in the Indian Army. On his application he referred to himself as an artist, a specialist in instruction diagrams for Cavalry, Infantry and Machine Gun Training and a camouflage expert. Given both his teaching and art qualifications, Smart found his niche as an instructor, particularly relating to camouflage, and he was very well-regarded. In fact, his application to the Indian Army was rejected because he could not be spared! In autumn 1917, Smart married nineteen year old Irene Godson in Surrey. She was the sister of a friend who had been killed in action. They settled in St Ives. With the exception of 1926 when they lived in Salcombe, he remained there until his death from a heart attack in 1947. During his post-war years he immersed himself in the life of St Ives and contributed greatly to its artistic community. Today he is usually described as a coastal artist but he also produced a series of highly accomplished industrial and architectural drawings. 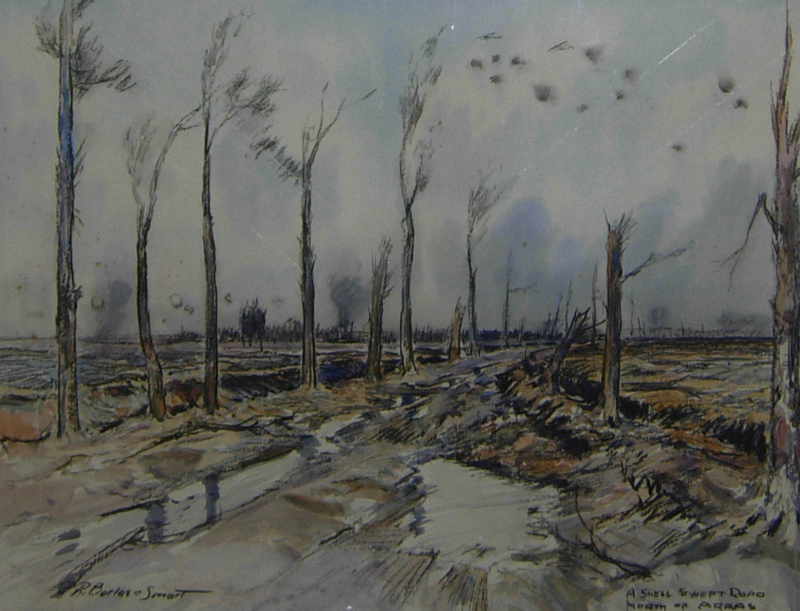 In addition, his works from the First World War endure as a first-hand record of an artist and soldier’s experience. You can find out more about Borlase Smart’s life and work on his official website. As part of our ‘Plymouth Remembers’ programme you can hear a talk by one of our curators about Borlase Smart on 8 November. Find out all the details here.